The LANtest Pro is a small hand-held cable tester, which enables network professionals to quickly and easily verify the integrity of Ethernet twisted pair cables. In one step, the LANtest Pro will test twisted pair cables for open pairs, shorted pairs, reversed pairs, crossed pairs and split pairs. Just push the TEST button, and the LANtest Pro will automatically scan for any existing faults in your cable. The specially designed remote terminator is provided for one-person testing of installed cables. 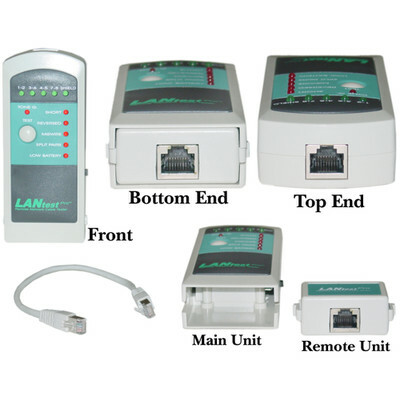 More Product InfoThe LANtest Pro is a small hand-held cable tester, which enables network professionals to quickly and easily verify the integrity of Ethernet twisted pair cables. In one step, the LANtest Pro will test twisted pair cables for open pairs, shorted pairs, reversed pairs, crossed pairs and split pairs. Just push the TEST button, and the LANtest Pro will automatically scan for any existing faults in your cable. The specially designed remote terminator is provided for one-person testing of installed cables.